The First Minister had been challenged about a dramatic increase in the number of teachers taking time off because of stress. At first minister’s questions at Holyrood, North East MSP Tom Mason referred to figures showing teacher absences had reached a total of 2,846 staff days since the start of term September last year. Mr Mason said the figure represented a 60% increase on the previous academic year. Ms Sturgeon said the Scottish Government was “working hard” to reduce teachers’ unnecessary workload. The first minister said: “We have just agreed with the teaching unions a pay deal that will significantly increase teachers’ pay, in recognition of the job that they do. Ms Sturgeon said the government was taking action to recruit and train teachers and argued that the new pay deal would help attract people into the profession and keep them in Scotland’s classrooms. Aberdeen City Council figures published earlier this week showed the number of teaching days lost to stress are at their highest for at least the last five years. Absences due to stress dropped to a low of 1,354 days in 2016-17 in Aberdeen. The previous high of 2,207 days, recorded in 2014-15, has been overtaken already. The most recent figure of 2,846 was a 60% rise on the 1,768 recorded in 2017/18. 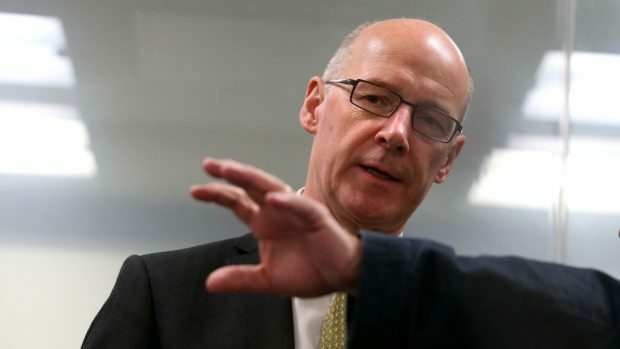 After his exchange with the first minister, Mr Mason said: “I would like Mr Swinney to engage with the city council and our teachers on the challenges they face. This would need to be one conversation where he listens, however. Earlier at first minister’s questions, stand-in Tory leader Jackson Carlaw said teacher shortages had led to a narrowing of subject choices in Scottish schools. Mr Carlaw said that pupils could study up to eight subjects in S4, but this had now been cut to six in most schools. Ms Sturgeon said teacher numbers had risen by 1,242 in Scotland as a whole since she became first minister.